Car accidents can happen at any time. They are almost always traumatic, at least to some degree, and can vary from a non-injury fender-bender to a life-ending collision. If you are one of the thousands of unlucky drivers who experience a car accident this year, follow some tips to help ease the stress associated with an accident. A smartphone can help you with almost everything you need. It likely has a camera, a notepad to take down the other driver’s information, and possibly even an app with your insurance information. Take your smartphone with you whenever you drive, along with your driver’s license and car registration. If you don’t have a smartphone, keep your insurance card, pen and paper, and even a disposable camera in your car. In minor accidents with no injuries, it’s a good idea to move cars to the side of the road to prevent additional accidents. If you’re not able to move the car for any reason, stay in it with your seatbelt fastened and hazard lights on until help arrives. Edmunds.com recommends taking pictures and documenting the accident. And, of course, you have to exchange information with the other driver(s). Once you are safe and help has arrived, you can move on to the paperwork. 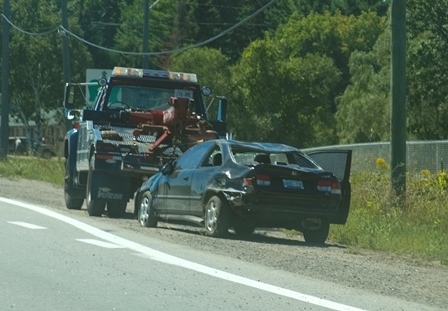 Car accident laws vary by state. In Nebraska, any accident causing personal injury or death, or more than $1,000 in damage, requires the completion of the Driver’s Motor Vehicle Accident Report. If the police are called to the scene, they may complete this. Further, there may be complications if the at-fault driver does not have sufficient insurance, or if the accident caused serious injury or death. The Nebraska DMV offers an accident guide that may give you a good place to start, along with other accident tips.